what is the deal with the fisherman with the bass guitar? 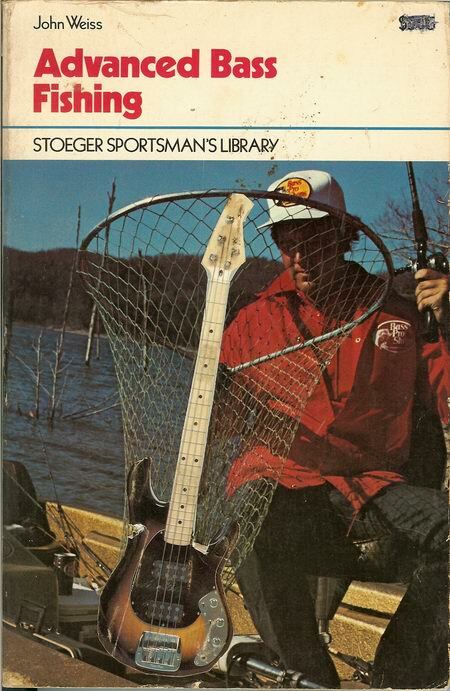 It was a book called “Advanced Bass Fishing” and it was not about music as you can guess! It was about fishing for bass, that wonderful freshwater species prevalent all over the united states. So Mike had seen this book in a bookstore, interpreted it in the musical sense, and, figuring I’d get a kick out of it, he’d cut the image of a Music Man bass (which happened to be my bass guitar at the time) out of the cover of an issue of Bass Player magazine and glued it onto the front of this book and gave it to me as a gift. Later, when I was working with Norma Jean Bell, somehow it got worked into the act, about halfway through the show they would bring me out and I would then perform a “Fishin’ Musician” country and western tune in which I would first brandish this book and say some inanities and then sing Commander Cody and the Lost Planet Airmen’s “Lost in the Ozone Again”, and I would do this schtick where I would pretend my bass was a tuba and blow on the fins while hammering-on some notes. Really ridiculous trick I learned from watching a Vegas band that played in the Renaissance Center one time when we had a gig there. At any rate they all liked it when I did it, even in the downtown urban Detroit atmosphere. So the Fishin’ Musician prevailed with Advanced Bass Fishing and Lost in the Ozone Again. In fact I had even forgotten about this book until Randall Jacobs, the guitarist from that gig (and also the guitarist for Dave Koz, Was Not Was, and writer of the song “Walk the Dinosaur”) reminded me of it on MySpace. So I resurrected the book. Big Hey to Randy, wassup man!! !